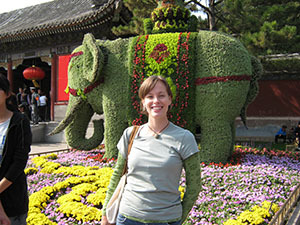 Neely enjoys touring the Summer Palace in Beijing. After graduating from Reinhardt with a B.S. in Early Childhood Education in 2005, Elizabeth “Beth” Neely taught elementary school for two years and then earned a Master’s in Applied Linguistics and English as a Second Language in May 2009 from Georgia State University. She’ll spend this year teaching English at Tsinghua University in Beijing, China, and is eager to explore another culture and become fluent in a second language. “I know almost no Chinese and am not very familiar with the Chinese culture, but to me, these were the very reasons to go to China,” she said. As a foreign language instructor, she will teach academic listening to students taking intensive English classes to prepare for university study in England. She will also teach listening and speaking to English majors. She will design the course syllabi and curriculum, assess learning and assign grades. “I may also be called upon to judge English ‘contests’… or grade English exams for placement into certain programs.” She is also hoping to incorporate some of what she researched for her master’s thesis — the teaching of lexical bundles for listening comprehension. 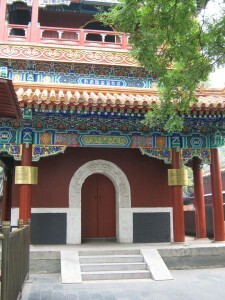 Lama temple “one of the few functioning Buddhist temples in Beijing,” was converted from an emperor’s residence into the temple around 1723. “It was incredible, to say the least,” Neely said. So where will Reinhardt take you? Neely remembers being asked that by a freshman orientation speaker who then described several Reinhardt alumni who had gone on to greater things. “I remembered being inspired by that. Truly, your college experience is a once-in-a-lifetime experience, and I’m glad I spent mine at Reinhardt,” she said.